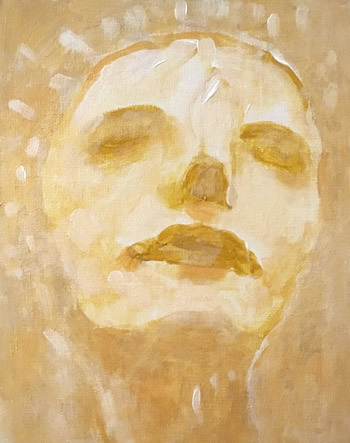 Above: "The Woman Clothed in the Golden Sun", 2019, acrylic on panel, 10" x 8" (Revelation Series). See a larger version here. All images on this site © by William T. Ayton, unless otherwise indicated. 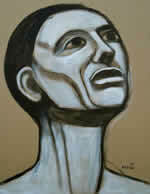 For more news, new images & updates, see Ayton's Art Blog. The new oil painting on panel, "Seasons in the Abyss: Winter" will be on show at the Limner Gallery in Hudson NY for the "Strange Figurations" show from September 6-30. 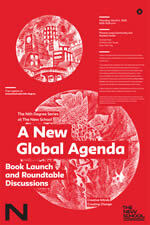 The poster for the book launch of Diana Ayton-Shenker's (the artist's wife) book, "A New Global Agenda" at the New School in NYC. Art by Ayton, poster design by The New School. See news item below for book details. Ayton did the cover artwork & 3 section-divider drawings for the book. 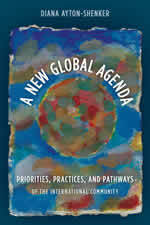 The small acrylic painting "It's a Small World" is on the cover of "A New Global Agenda" (Rowman & Littlefield) by Diana Ayton-Shenker (the artist's wife). The book addresses challenges facing our world & possible strategies for dealing with them. The 1992 UDHR Article 25 painting (Spanish version) can be seen on this poster for a symposium, "Human Rights and the Social Determinants of Health" at the University of Toronto's Munk School of Global Affairs, which runs from May 4-5, 2017. The 2016 acrylic painting, Caught In The Orbit Of Power was on show at the Limner Gallery in Hudson NY for the "Emerging Artists" show from March 1-25, 2017. Reception was on Saturday, March 4 from 5-7pm. The 2010 portrait drawing of Mariah O for Julia Kay's Portrait Party is to be included in the book Portrait Revolution available around April 2017. The book will be available in both US & UK versions. The 2012 acrylic on Kraft paper painting, The Rise of the Subhumans will be on show at the Limner Gallery in Hudson NY for the "Emerging Artists" show from March 4 to April 2, 2016. Reception is on Saturday, March 5 from 5-7pm. The University of Santa Catarina in Brazil is using the monochrome pencil & ink studies for the UDHR (Universal Declaration of Human Rights) series in its online course materials. 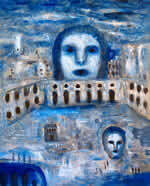 See the UDHRArt.org web site news page for further details. 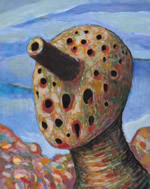 Ayton had some new small paintings in the show "Outsider Artists of the Hudson Valley (& Friends)" at the Atwater Art Gallery, Rhinebeck NY in October 2014. To the left is the 2014 painting, "The Outsider (in Red)" which was on display with several other new works. 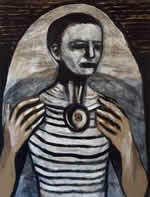 Ayton's monochrome 2014 painting on cardboard, "The Man Who Saw the World from Inside a Protective Bubble", was at the Limner Gallery's "Strange Figurations" show from Sept. 11 to Oct. 14, 2014, in Hudson NY. 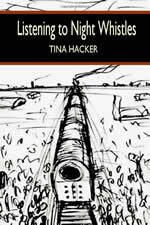 Ayton's drawing "The Train" from his 2005 Holocaust series is featured on the cover of poet Tina Hacker's new collection, "Listening to Night Whistles" published by Aldrich Press and now available via Amazon. 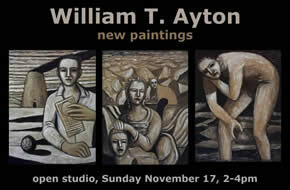 Open studio event, Sunday Nov. 17 from 2-4pm. Please contact us (bottom link on sidebar) for more info. "The Strange Case of the Tragic Hero" monochrome acrylic painting on cardboard (at right) was on show at the Limner Gallery in the "Show of Heads", Hudson NY from Oct 24-Nov 24. The painting of UDHR Article 5 was featured on this new book by Italian professor Silvia Scarpa & published by UniversItalia. For more details, please click here. See Ayton's most recent works: NEW 2019 Gallery. For the other galleries, please see the navigation links on the left side of this and almost every page. Welcome to the web site of British artist William T. Ayton (now resident in Rhinebeck in the Hudson Valley of upstate New York). 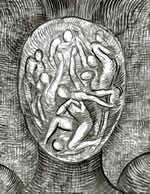 The artist's work inhabits the interface between myth, the human condition, beauty & imagination. 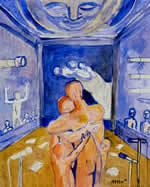 Ayton's art has variously been described as surrealistic, symbolist, mystical, visionary and expressionistic. Here is a new portfolio of Ayton's socio-political artwork (featuring the UDHR, War Room, Holocaust, and other works of a more political nature). Image at right is "The Shootist", 2017, acrylic on board, 14" x 11". This is a series of 24 small monochrome paintings inspired in part by recent political events around the globe, and also intended as a warning for the future. See the entire series on Flickr. 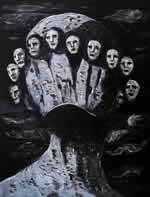 This is a 5-panel painting (acrylic on cardboard) depicting many of the artist's themes and concerns. You can see the individual panels as well as a higher resolution version on Flickr. 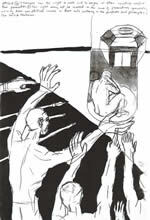 In Humanity is a series of ink drawings which was started around the same time as the UDHR series (see item below). 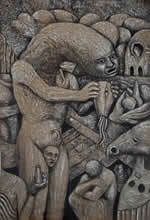 It consists of around 36 drawings which focus on challenges and problems that the human race faces or has created for itself. The entire series, spanning a period of 20 years, can be seen on Flickr. The Book of Souls is a collaboration with Tim Lowly (see also in news section below left) featuring portraits and other work by Ayton, with photography, art & Photoshop processing / remixing by Lowly. The Universal Declaration of Human Rights (U.D.H.R.) was signed on December 10th, 1948, by the United Nations. 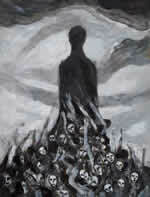 In 1991 & 1992, Ayton did a series of drawings and paintings based on the UDHR which have been extensively exhibited in Europe and the USA. Click the image at left or here to see the UDHR paintings, on a site created specifically to showcase them, plus the original drawings and a Spanish version of the paintings created in Seville in 1992. Please email info@ayton.net if you are interested in using the UDHR images for appropriate purposes. Now available from Amazon.com & Barnes & Noble, & many other fine booksellers. 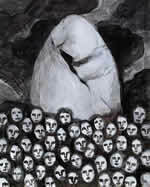 Selected by Poetry.About.com as one of the Best Books of 2009. Click here for details. Featuring poems & prose by Katz, & the cover painting ("North America's Skull") & interior ink drawings by William T. Ayton. The book is published by Narcissus Press (Jan. 2009). You can see a preview page here. MUSEUM ON THE SEAM - "BARE LIFE"
October 2007 - June 2008 -- The small painting, "Hiroshima: Ground Zero" (left), as well as several War Room studies, were in the show, "Bare Life" at the Museum on the Seam, in Jerusalem, Israel. Opening was Oct 12th, it ran until June 2008. Click here to see the invitation to the show. The show featured 42 artists from around the world, including Anselm Kiefer, Bruce Nauman, Bill Viola, Sophie Calle & William Kentridge. 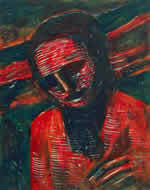 Curator: Raphie Etgar. 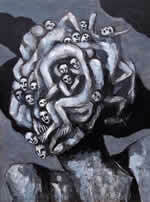 Update: the Hiroshima painting apparently remained on show until February 2009. 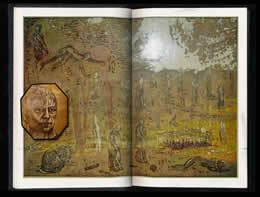 The War Room is an anti-war installation of four wall-sized painted panels by Ayton showing the four faces of war. We have uninstalled the two versions from sites in New York City and Poughkeepsie (September 2004). Several of the works on this website have also been on show in exhibitions in Washington, DC & Milwaukee, WI, with more shows on the way. Visit The War Room. William T. Ayton is represented in the upstate New York region by the Limner Gallery of Hudson, NY. The gallery is located at 123 Warren Street, Hudson, NY 12534. Phone: 518-828-2343. Click here for the gallery's home page, and here for Ayton's artist page on the Limner Gallery web site. Here is a selected gallery of published Ayton images—covers, illustrations, wine labels, and so on, collected in one place. More images will be added as they appear. Cover of Paris/Atlantic literary review, 1994.